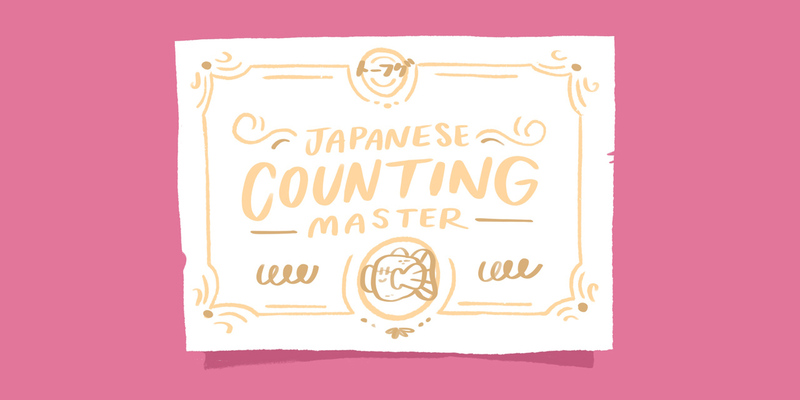 Basic counting in Japanese is pretty easy, but the topic can get much, much more complex. 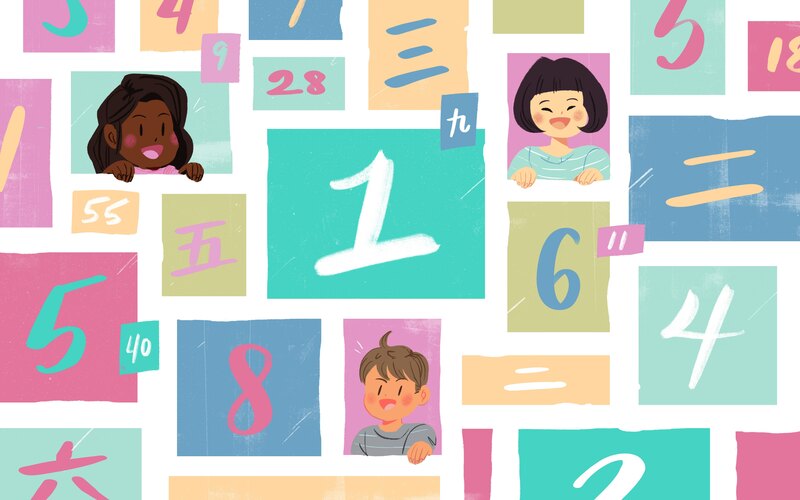 If you're a new student of Japanese, one of the first things you'll learn is how to count. 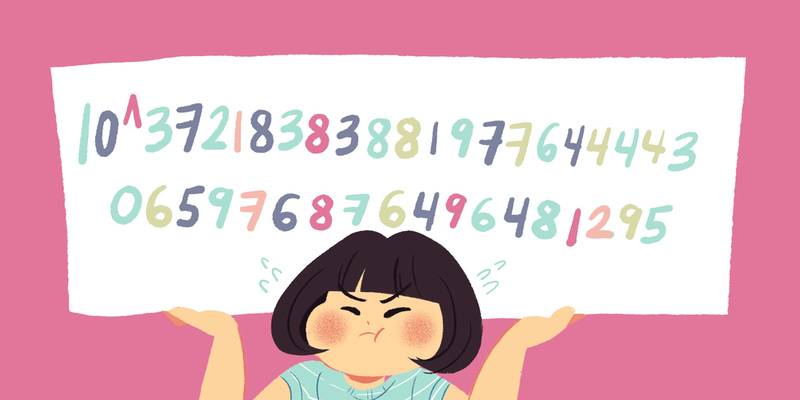 Basic counting in Japanese is pretty easy, but the topic can get much, much more complex. And while plenty of people can count to ten in Japanese (remember those introductory martial arts classes at your local dojo? ), there is much more to learn. Besides counting from 1 to 100, in this lesson you'll learn about large number units: billions, trillions, even vigintillions and duovigintillions! You'll peek behind the curtain of an East Asian Buddhist sutra, which includes 123 units of counting. And you'll be introduced to the Wago style of counting—that is, how to count in archaic Japanese. That being said, there are some situations where it's still commonly used today. Prerequisites: To get the most out of this article, you'll need to be able to read Hiragana. If you can't do this yet, check out our Hiragana guide, which uses mnemonics to teach you how to learn to read them all in a day. You'll also need to know a little kanji, though you can always look up the ones you don't know in your favorite Japanese dictionary. 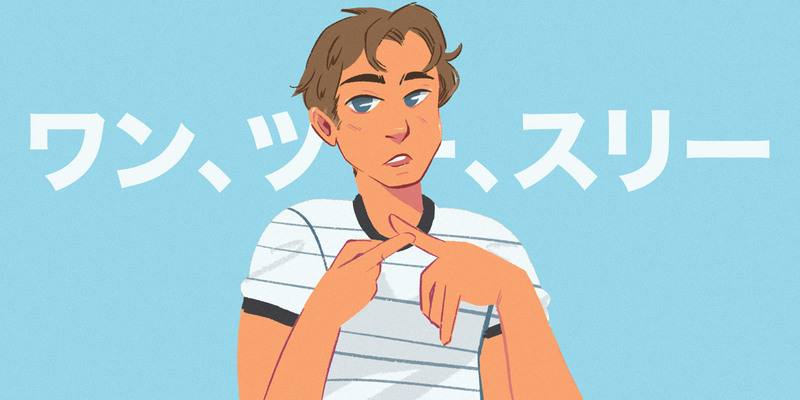 Regardless of your skill level, you're definitely going to learn something about counting in Japanese, and some of your newfound knowledge just might eclipse that of a native Japanese speaker. (Really!) Okay, 1…2…3… let's get started! Before you get started, consider [listening to the podcast of this episode! It's a good overview, and goes deeper into several of these topics. To get all of Tofugu's podcast episodes, be sure to subscribe to the podcast. To compress a long history into a much, much sorter one, modern Japanese comes from three different sources. Many words are from the original Japanese language, which is called Wago 和語 or Yamato-kotoba 大和言葉. Other words originate from Chinese, called Kango 漢語, and the rest, called Gairaigo 外来語, are foreign words (that are not Kango) that have slipped into the language over time. To oversimplify, modern Japanese is a mix of all three. Because of that history, there are two primary ways to count in Japanese now. As you might be able to guess, one comes from the Wago system while the other comes from Kango and the Chinese counting system. Let's compare them, 1 through 10. They look and sound completely different, don't they? But don't worry. You won't be required to remember two complete sets of counting systems. In modern Japanese, the Wago version is usually only used through the first ten numbers. Kango is used from 1 to… forever, theoretically. Now, here's a slightly different chart, one with kanji and Kango numbers. Can you spot the difference between it and the first chart's Kango column? 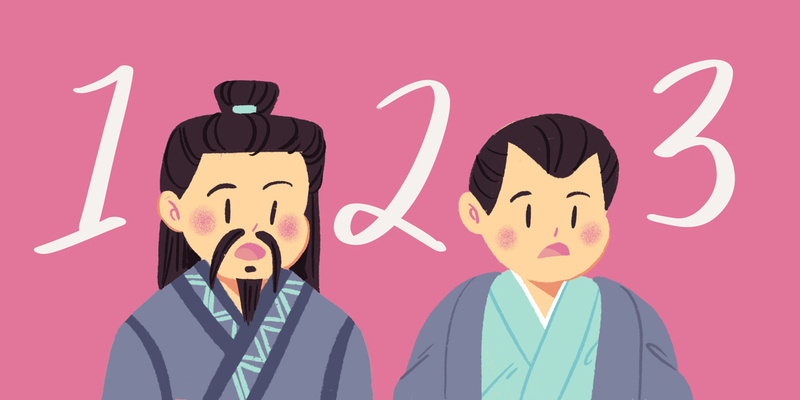 Because of that history, there are two primary ways to count in Japanese now. As you might be able to guess, one comes from the Wago system while the other comes from Kango. One difference between the two charts is that the second contains the number 0. The Kango word for 0 is れい; it can also be written as ゼロ. The English word for 0 was imported in the Meiji period (1868–1912), and is more commonly used nowadays. But there's another difference in the second chart. Note the extra Kango reading for 四/4, 九/9, and 七/7. The Kango word for 4 is し, which sounds just like 死—"death." Hmmm. Similarly, 九 can be read as きゅう. The original reading, く, sounds the same as 苦, which means "suffering." Both 4 and 9 received alternative versions because people wanted to avoid these negative associations. The secondary reading for 7 (なな) is used because しち sounds too much like いち or even し. Think of it as similar to the potential confusion in English between the pronunciation of the numbers "50" and "15." Here's another twist: the alternate readings for 4 and 7 come from the Wago readings of the numbers. Including ゼロ (zero), our Kango counting list is actually a mix of English, Old Japanese, and Chinese! As for how common it is to learn to count with the alternative versions of 4 and 7, pre– and primary schoolteachers are teaching よん and なな to kids nowadays to prevent confusion in counting. It's likely to become the standard, if it isn't already. Either way, both versions are common, and whichever one you choose, most folks will understand you just fine. 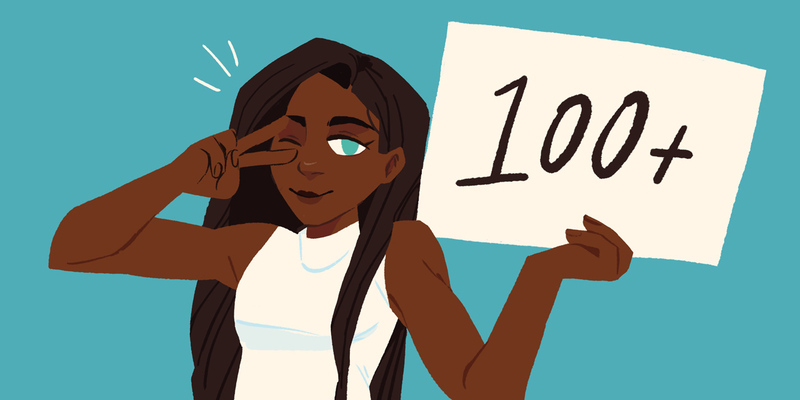 For numbers larger than 10, it's actually very simple to count in Japanese. You don't have to memorize any new words like "eleven," "twelve," "twenty," "thirty," and so on; you simply use a combination of the numbers you've already memorized. For example, if you want to say "11" in Japanese, you just break it out into the parts 10 and 1. 10 in Japanese is じゅう and 1 is いち. Combine the two (じゅう+いち) and you get じゅういち. Congrats! What about 23? Same thing: break it out into the parts 20 and 3. Start by breaking 20 down into 2 and 10: 2 in Japanese is に; 10 is じゅう. Combine them to get にじゅう, which is 20. 3 is さん, so if you combine 20 and 3 you get にじゅうさん. Easy, right? Although this may seem a little complicated at first, it becomes pretty easy if you do it a few times. You don't even need to do any actual math. It's more like a simple number puzzle. Assuming you've memorized 1 through 10 already, you can use the following charts to guess what the numbers will be, then check your answers. By the time you're done, you'll be able to count to 100 in Japanese! Note: Numbers 40–49 are almost always read as よんじゅう and not しじゅう. Occasionally you'll hear an elderly person use しじゅう when talking about their age. You'll also occasionally hear idioms and phrases from older times that use the しじゅう reading. For example, 四十肩 (しじゅうかた) means "frozen shoulder." 四十九日 (しじゅうくにち) refers to the 49th day after one's death—a special day in Japanese Buddhism. And 四十七士 (しじゅうしちし) refers to the 47 loyal retainers of the Akō Domain. There's more, but you get the idea. Using しじゅう is considered archaic, but you may still run across it from time to time. Note: The 七十s are almost always read ななじゅう. You may hear older people use しちじゅう, but it's not very common. Note #1: The 九十s are almost always read as きゅうじゅう. The main exception to this is with certain location names, such as 九十九里浜 (くじゅうくりはま). Note #2: くじゅう is a homophone of 苦汁, which means "bitter soup" and figuratively means "hard time" or "bitter experience." 苦渋, another homophone of くじゅう, means "deeply troubled" or "distressed." You can understand why most people would want to say きゅうじゅう instead of くじゅう. And with that, you can count to 99 in Japanese! If you study the patterns closely, you'll discover some that are repeated over and over again. Once you figure out those, you'll be able to easily count in Japanese and, with practice, use Japanese numbers easily and without a hitch. Counting above 99 in Japanese is just as simple. The only difference is the numbers are going to get longer. You will also need to learn a few new unit names. It can be confusing to go from English to Japanese unit names and vice-versa. Speaking of which, how do you suppose you would count between 一万 (いちまん /10,000) and 一億 (いちおく/100,000,000)? It's similar to how you did it earlier, only with larger numbers. Just as in English you would say "ten thousand," the Japanese read 100,000 as 十万 (じゅうまん)—"ten ten-thousands." Add another zero and you would say 百万 (ひゃくまん): one hundred ten-thousands, a.k.a 1,000,000—"one million"—in English. 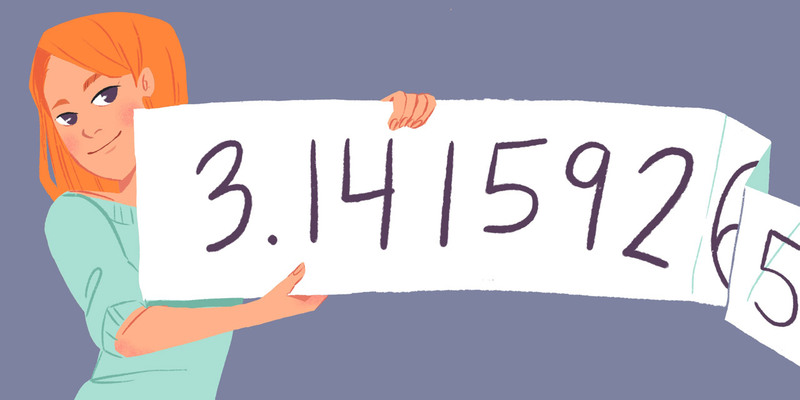 Some general counting rules for big numbers are worth remembering. 四百, 四千, and 四万 are always read with よん for 4; 七百, 七千, and 七万 are always read with なな for 7; 九百, 九千, and 九万 are always read with きゅう for 9. This pattern continues into higher units of counting as well. Finally, when a 0 appears in the number, you don't have to read it out loud (with a couple of exceptions we'll tell you about later). So "303" would be さんびゃくさん, not さんびゃくれいさん or さんびゃくゼロさん. Let's practice reading numbers for a little bit. Afterward, we'll get into the really obscure stuff. Ready? Note: In this example, なな could have been しち, but なな is more common. Note: 七百 is always ななひゃく, never しちひゃく. The last なな could have been しち, but なな is more common. Remember that you don't need to read the zero. Note: 1,000 can be read as 一千 (いっせん) as well, but just 千 on its own is more common. Note: 九百 is always きゅうひゃく, never くひゃく. よん can be し, but よん is more common. Note: 四百 is always よんひゃく, never しひゃく. Note: 10,000 always has to be いちまん ("one ten-thousand"). It can't just be まん. Note: The last きゅう can be く, although きゅう is more common. Note: 四百 is always read よんひゃく, not しひゃく. 七十 could be read as しちじゅう by older people, but usually it's ななじゅう. 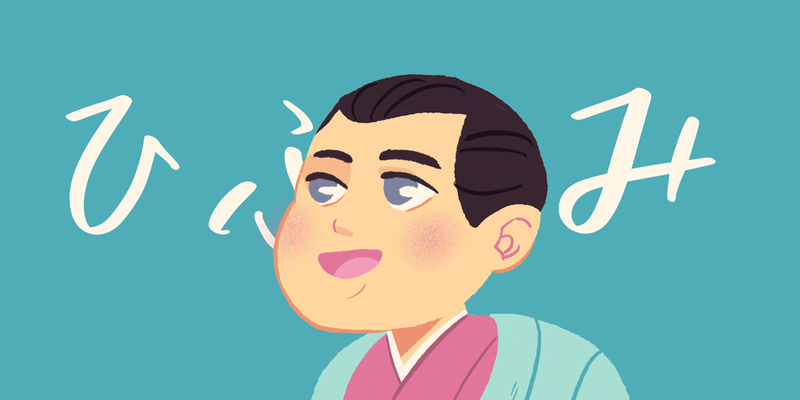 The last 九 could be く, but きゅう is more common. Note: 1,0000,0000 has to be read as 一億 (いちおく), and not just 億 on its own. 九千 is always きゅうせん and never くせん. 九百 is always きゅうひゃく and never くひゃく. 九十 is always きゅうじゅう, except for special cases such as the name of a location. Finally, 九万 is always read きゅうまん, not くまん. I hope that practice helped you to see some of the patterns in Japanese counting. Experience really is the best teacher, though, so keep reading out numbers and it will become natural soon. For those of you who might be numbers otaku, cosmologists, or the latest Mega Millions winners, the following chart contains really big numbers. It gets kind of funny, too, as if the people who came up with these names were in on some kind of joke. For example, the second-to-last unit name for 1064—a.k.a. 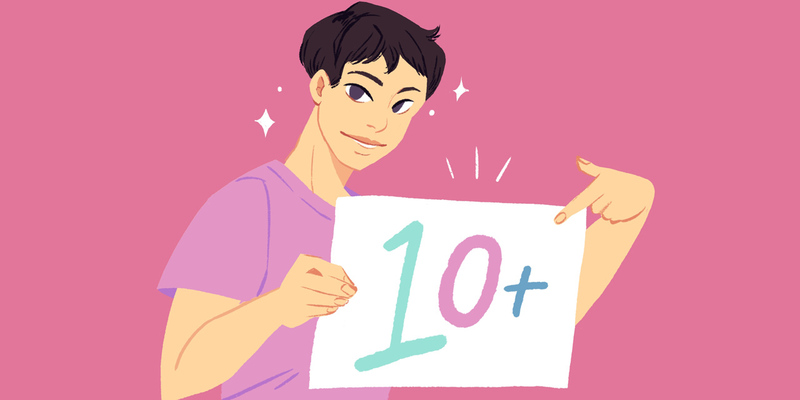 10 vigintillion—is 不可思議 (ふかしぎ), which means "incomprehensible" or "mystery." Then there's the last unit name on the list: 1068, a.k.a. 100 duovigintillions. In Japanese, it's called 無量大数 (むりょうたいすう), which means "immeasurable large number." No kidding! If this looks like a lot, apparently in the Avatamsaka Sutra (法華経/ほっけきょう), the "Flower Garland Sutra" of East Asian Buddhism, the reader is introduced to 123 different independent number units. And there's a number unit that's even higher than our "immeasurable large number": 不可説不可説転—the number 10372183838819776444413065976876496481295! What the heck?! Remember that you don't read 0s out loud? Well, here are those couple of exceptions we promised. When you're reading individual numbers aloud (like when you're providing someone with your credit card number). When a number with a decimal point starts with a zero. In most cases, 4s, 7s, and 9s should be read as よん, なな, and きゅう. The only exception is if you're reading them aloud, 1 through 10, in order. Although it's less common than the way we've described above, we want to alert you to a few unexpected usages of decimals in Japanese. Luckily for you, only 分 and 厘 got much use back in the day, and today they see even less usage—just in extremely specific situations. Here they are. 分 can be used as part of one's body temperature measurement. 三十六度九分 (さんじゅうろくどくぶ), for example, is 36.9 ℃. The 三十六 is "36," 度 is "degrees," and 九 is "9." It isn't until the end that we run into the 分. Checking the chart, we see this is 10-1, which means we move the decimal to the left one spot. 三十六度九分 is 36.9. Both 分 and 厘 are used for ratios. One good example is a batting average in baseball. He won the title with a .365 (batting) average. Notice anything weird? 分 is for one decimal place (1/10), and 厘 is for two decimal places (1/100). But in the case of the example sentence above, the decimal slid one more spot, didn't it? Let's figure out why. To start with, there is actually another unit name for "percentage," which is 割 (わり). What 割 does is it multiplies the number before it by 10%. For example, ８割 is 80% (8 multiplied by 10%/割 = 80%). If you see ５割引き in a store, it means something is 50% off. 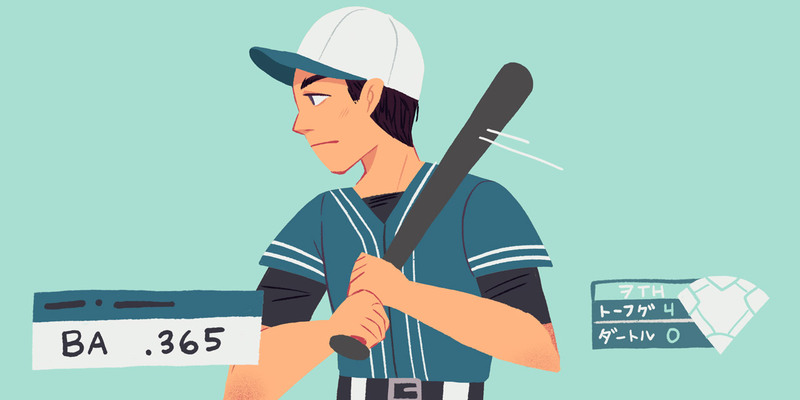 In the case of the batting average, though, 分 is considered to be 1/10th of 割, and 厘 is considered to be 1/100th 割. Confusing, isn't it? But don't fret. If you memorize these irregular use cases, you'll be good to go. That, or just don't go to baseball games. The 分 from the decimals chart gets used for time, too. Have you ever wondered why minutes are __分 in Japanese? Now you know. In this case, however, 分 represents not 1/10th, but 1/60th of an hour! It is matching time's sexagesimal system. 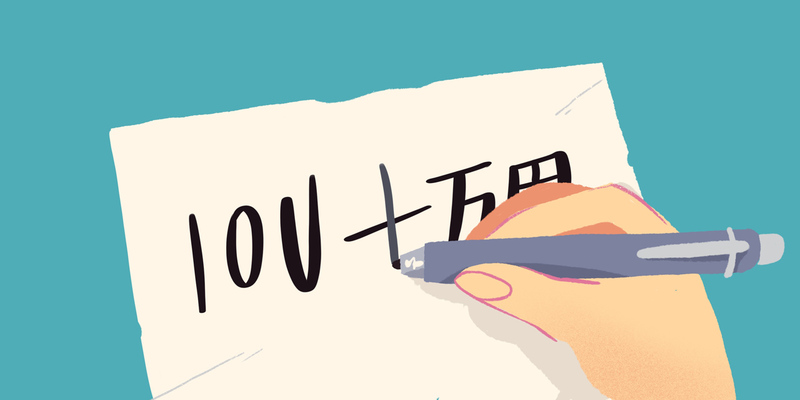 We wrote all about this 1/60th use of 分 in our counters series. Obviously, there are many more decimal words—not a vigintillion, but a lot of them—with multiple uses and variations depending on who's using them. But it's interesting to see things like 毛 (hair), 糸 (string), 微 (minuteness), 塵 (dust), 埃 (dust), 模糊 (dim), 逡巡 (hesitation), 瞬足 (instantaneous), 刹那 (instant/moment), 虚空 (the sky/the air/empty space), and finally 涅槃寂静 (enlightenment leads to serenity). Hopefully, though, you won't be talking about a number to the power of 10-16 very often. I'd recommend spending most of your decimal-related vocabulary study time on only the first few. Although the above units are barely used anymore, I was able to find and come up with some idiomatic usages that still remain. See, even "useless" words can end up being useful in some way. With financial and legal documents, complex versions of the number kanji—known as 大字 (だいじ)—are used to help prevent fraud. For example, take a look at this image of a Japanese ¥10,000 bill. Normally, the printed information would read 一万円 (いちまんえん). Here, however, it reads as 壱万円 (also いちまんえん), the kanji for "1" replaced with 壱, a more complicated version of 一. Another example is the ¥2,000 bill. Normally it would read 二千円 (にせんえん). But here it appears as 弐千円. 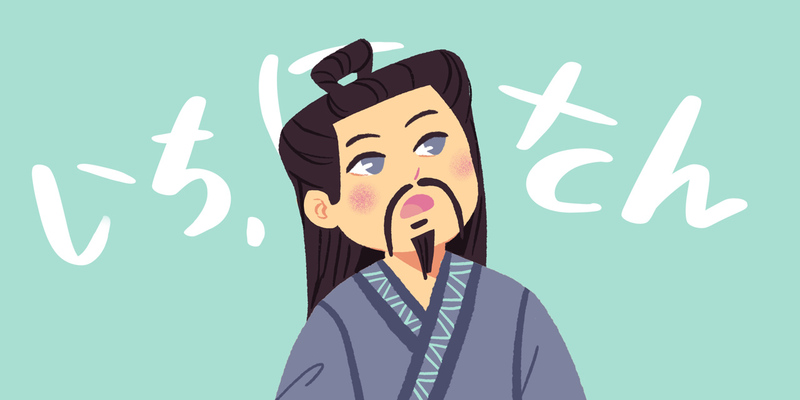 弐 is the daiji version of 二. Why do these exist? You've probably already figured it out. The number "一" can easily be turned into all manner of things: 二 (2), 三 (3), 五 (5), 六 (6), or 十 (10). What started out as ¥10,000 could be altered to ¥100,000 (一万円 → 十万円) or even ¥200,000 (if you used 廿万円). You can see the problem. And so, in 703, the Taihō Code was born, which required people to use the daiji system for official documents. The custom still exists today. One quick note: when writing daiji, you basically write it like you write regular kanji numerals. There is one exception, though: sometimes you write in a "1" (壱) that you wouldn't usually write. For example, 110 can be either 百拾 (literally 100-10, the regular way to write numbers in Japanese) or 壱百壱拾 (1-100-1-10). But, you wouldn't write it in the Arabic style, like 壱壱零 (1-1-0). If you remember back to the beginning of this lesson, we mentioned the Wago and Kango counting systems. We told you that you only need to remember 1 through 10 in Wago; that anything beyond that is archaic. You'll definitely want to memorize ひとつ, ふたつ, みっつ, よっつ, いつつ, むっつ, ななつ, やっつ, ここのつ, and とお. Plenty of folks use the ひ, ふ, み, よ, etc., counting method, but it's not nearly not as common as the 〜つ version. The つ is actually a suffix to count general things, similar to the modern counter 個 (こ). We'll have to save our discussion of the Japanese counters system for a different article—things get complicated—but be aware that the つ suffix can be really useful when you don't know the counter for something. That being said, it can only be used on numbers 1 to 9; for some reason, 10 doesn't get included. Above that, people used to use ち or ぢ, which we're going to see in a moment. 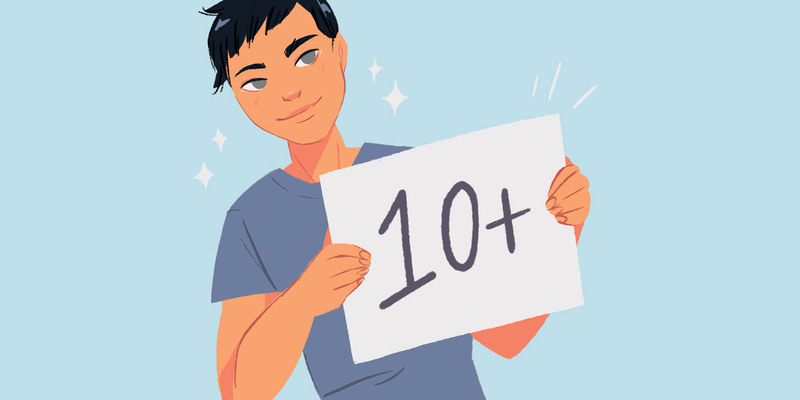 Although you'll (probably) only rarely come across anyone counting past 10 using the Wago method, you will come across idiomatic examples of it now and then. There aren't many, so we'd suggest memorizing them as vocabulary. And unless you're studying Classical Japanese, memorizing the Wago counting method on its own may not be helpful. And yet: if you're a regular Tofugu reader, you're probably curious about this kind of thing, and we think it's super interesting, too. Plus, you'll know something most normal Japanese folks don't! Wago is pretty similar to Kango in that it combines numbers to make bigger ones. For Kango, 10 (じゅう) and 1 (いち) would make 11 (じゅういち). In Wago, the only difference is that you insert a word—あまり—between the 10 (とお) and the 1 (ひとつ). Thus 11 would be read とお あまり ひとつ. あまり, you might know already, means "remainder," "the rest," or "leftovers." It's still used in mathematics when there's a remainder. For example, 11 divided by 10 equals 1 with a remainder of 1. In modern Japanese, the answer would be read as いち あまり いち. Wago is pretty similar to Kango… In Wago, the only difference is that you insert a word—あまり—between the 10 (とお) and the 1 (ひとつ). If you think about it, both the combining and the remaindering are basically the same thing. So what about the number 22? In Wago style counting, 20 is read はたち, so 22 is read はたち あまり ふたつ. It's 20 with a remainder of 2. 30 through 90 are easier because they work similarly to the Kango system, don't have special names, and follow a consistent pattern. For example, 30 is 3 (み) x 10 (そ), making it みそ. Then, you add the suffix for counting general things (ち) to make it みそち/みそぢ. Basically, it's the short Wago version of the first number, plus そ, plus the counter suffix ち. We'll go through all the Wago numbers from 10 to 99. Then we'll take a look at the numerals 100 and above. The Wago counting method for 20 is はたち. This reading is still commonly used to refer to someone's age. ２０歳 can be read as either にじゅうっさい or はたち. The Wago version of 30 is みそち or みそぢ (or the modern version is みそじ). This reading is still common when referring to someone who is 30 years old. It's written with the kanji 三十路 and usually carries a negative nuance that you are getting old. You'll also see みそじ being used for the last day of December. It's called 大晦日 (おおみそか), which translates to "big miso day." You may be wondering why the 30th would be the last day of December, but remember that the old lunar calendar had 29 to 30 days per month. Finally, you may run into 和歌 (わか) or 短歌 (たんか), classical short poems written in a 5-7-5-7-7 meter pattern. These are called 三十一文字 (みそひともじ), as the total number of 音 (which are like syllables… kind of) is 31. The Wago for 40 is よそち or よそぢ. This reading actually still refers to people's age when they are forty. These days, it's written as 四十路 and read as よそじ. That being said, it's not as common as 二十歳 (はたち) or 三十路 (みそじ). After 40, you won't see Wago readings for age at all. That was easy, right? Once you've learned the first ten as well as the pattern, it's just a simple number-math riddle. Hitting 100 and above requires you to use the same pattern you learned before, with new unit names. 100 works like 10: when it's used by itself (100–199), it's read もも or ももち. When it's above 199, along with other numbers, it's read as ほ. 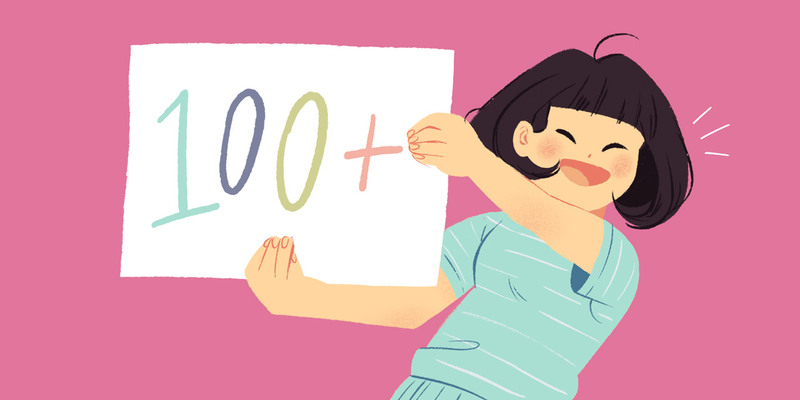 100 is ももち and 101 is ももち あまり ひとつ, but 200 is ふたほ, and 300 is みほ, etc. Moving on to other units, 1,000 is ち and 10,000 is よろづ. They don't have different readings like 10s' そ and 100s' ほ, so 1,500 is ちいほ, 2,000 is ふたち, 15,000 is よろづいち, and 20,000 is ふたよろづ. There's a Japanese term, 八百万の神 (やおよろず の かみ), that means 800,000 (800 x 10,000) gods. If you were watching closely, you may have seen reference to it in Spirited Away. In the film, all kinds of gods were living in the abandoned amusement park. Also, the main character's name is 千尋 (ちひろ). The kanji 千 means 1,000, and its Wago reading is ち. But her nickname was せん, the Kango reading for the same thing! Another word uses 八百 (やお): 八百長 (やおちょう), which means a "fix" or "set-up." For example, you might say, "That game was a fix!" (あの試合しあいは八百長だ！). This word came about because of a man named 長兵衛 (ちょうべい), a green grocer (八百屋/やおや), who loved playing Go. He was very good at it, but apparently would intentionally lose games so his friends would feel bad and buy veggies at his store. One day he was invited to play against Hon'inbō Shūgen, whom he could battle evenly with. Because of this, people learned he was intentionally losing his games to them, and the word 八百長 (やおちょう) was born. It's an abbreviation of 八百屋の長兵衛 (やおやのちょうべい), and has come to be used to describe a fixed game, or a game where someone isn't being serious. Finally, there is one last counting method I want to introduce you to: English. We haven't broached this topic yet, since all the numbers are used fairly often (we referenced ゼロ a few times in the Kango section). Most Japanese people know the English words for numbers, at least 0 through 10, and you'll see them used in written form as well. Their pronunciation is different from that of traditional English, however. If you can read Katakana, you'll be able to see how it differs by reading the list of numbers above. Japanese speakers have been slowly transitioning their counting method from Wago to Kango since the late 1800s. Kango has gradually became more popular and, following World War II, fewer and fewer Japanese people count beyond 10 using the Wago method. By introducing how to count in Wago to you, the Tofugu readership, we have probably single-handedly tripled the worldwide population of people who can do it. And you are one of them! With all that, you are almost a Japanese counting master. As we mentioned before, there is one big topic we haven't covered yet: Japanese counters (助数詞). But that knowledge will come with time (and more articles). For now, stick with it, and eventually you'll find your masterhood will manifest! We put together a spreadsheet containing most of the numbers from this article. Upload them to your favorite SRS for study, or use it at the office since it'll look like you're working on that TPS report.